Time to observe Palestinian Propety Rights. Because of the Israeli lobby and AIPAC, most Americans – and certainly most of Congress – believe nearly anything Israel says, even to the point of overlooking what Israel does. Case in point is the flap over VP Biden’s trip to Israel and Israeli housing announcement in West Jerusalem. The Americans say they believe that the kind of rude surprise that occurred when Vice President Joseph R. Biden Jr. was visiting here earlier this month — an Israeli announcement of 1,600 units of Jewish housing in a part of Jerusalem conquered by Israel in 1967 and claimed by the Palestinians — is not likely to be repeated in the coming months. That was one of Mrs. Clinton’s central demands of Mr. Netanyahu: no more acts that disturb the atmosphere as indirect talks with the Palestinians get under way. The 1,600 units in East Jerusalem constituted the latest of several steps that the Americans considered problematic. This morning on CNN’s Fareed Zakaria’s GPS, the major discussion was the Israeli – Palestinian negotiations, and the break down caused by the housing announcement. That conversation reminded me once again that no one in the media, or anywhere else for that matter, has mentioned that building the housing in Palestinian West Jerusalem occupies yet more of the rapidly shrinking Palestinian territory or that it appears Israel’s continued settlement plans in the West Bank are preventing a two-state solution. There are only two possible outcomes to the current scenario of expanded settlements in Palestinian territories within the next 50 years. One is that Israel will cease to be Jewish because the Muslim and Christian Palestinian population is growing much faster than the Jewish population. Jewish Israelis will become a minority. When the majority of the population ceases to be Jewish, can the current Jewish political parties continue to exist as they do now? Not likely. Unless Israel ceases to be a democracy by denying non-Jewish residents the right to vote, then Palestinians will dominate Israeli politics. The second outcome is that Israel, including all of the West Bank and Gaza, becomes more like apartheid South Africa with a ruling overclass of Jews and a permanent underclass of Palestinians, where rights are denied and the rule of law is unequally distributed between Jews and Palestinians. If this event occurs, peace will not even be in the cards for Israel. The fact that hardline, right Israeli’s don’t – or won’t – see these outcomes is stunning in both their blindness and lack of logic. Of course, these hardliners see another outcome altogether. In that one, all Palestinians are shoved out of Israel, the West Bank and Gaza – or killed, whichever comes first. In the U.S., there’s a heated argument going on about Immigration, with many saying immigrants are taking over large tracts of the southwest and elsewhere and that immigration should be halted. Imagine, then, how Palestinian’s must feel. Where is the sense of equity and balance and justice when Americans say no to migration here but okay in Israel? The U.S. has a long history of protecting property rights, even to the point of allowing long-time squatters the legal right of eminent domain. Yet, the U.S. aids and all too often abets Israel’s denying those same property rights to Palestinians, only because that population just happens to have differing religions. I remain a firm believer that Israel has a right to exist and exist in peace, but I am not one to close my eyes and ears to Israel’s faults. 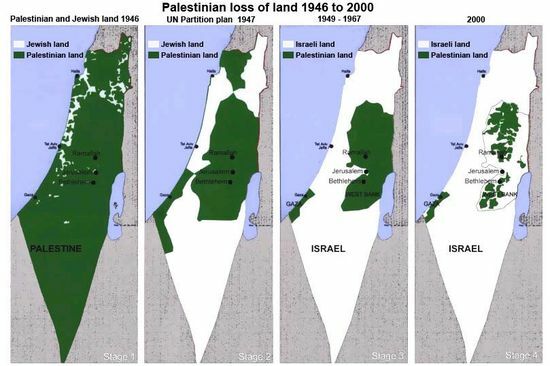 Blatantly stealing and occupying another people’s property, namely the Palestinians’, is dead wrong. No two ways about it. Al Jerezza video reports first days of Iranian protests. Watch it. Share it. Al Jerezza reported on the Iranian protests following the election. The video report is nearly 25 minutes but definitely worth watching. It’s the only real, in depth report from the country on what has happened, how badly the government cracked down on the people and, more importantly, what the Iranians want. No matter how much the repressive, religious government of Iran tries to tell the world that the protests were minor, caused by a few trouble makers who received orders and backing from foreign sources, the truth cannot be hidden or whitewashed. The people want freedom…and now have decided for themselves that they no longer want the religious government began by Khomeni. The government of Ahmadinedjad is not just illegal, it’s barbaric and criminal. It should be given no rights, no approval in the world community. Following the example of Ayatollah Ali Sistani in calling for a separation of religion and state is Ayatollah Amoli of Iran. Amoli, who led the Friday prayers sermon in Qom, believes that the best way to resolve the current situation is a separation between the executive branch, the judicial branch and the Islamic jurist. Amoli said separation of powers is not a recent phenomenon and it existed before Islam. “Separation of powers does not belong to a particular century. Islamic and non-Islamic governments have it now, too,” he said. The hard line Iranian clerics, politicians, and Republican Guard are WRONG! Islam in Iran is failing as a result of the hard line ideology and control by the government. Religion cannot survive when forced onto a population by repression, coercion, and censorship. That idea failed in Europe. It will fail in Iran…and elsewhere in the world. But then do Ahmedinejad, the Supreme Leader, and other hard lie clerics really believe in the Qu’ran and the vision of Muhammad or are they more interested in retraining power in order to create chaos and disorder in the world? They believe that in bringing about chaos they will hasten the “end of days” and bring about the return of the Hidden Imam. Many people throughout the world are adherents of “hasten the end of days,” but only in Iran has this ideology been institutionalized by the ruling government. They must be stopped. The rational, thinking, educated people of Iran must be supported; their voices must be heard. The free media must be pushed to keep their story front and center. It was rumored this morning on Twitter from Iran tht Mohsen Makmakbaf was arrested by the Iranian government. Mr. Makhmalbaf is Iran’s premier film maker. He spoke with Foreign Policy Magazine in Paris in which he discussed the election. On 6/23 in Italy, he made this video. English Translation by IRAN, and not the author of this blog. Mohsen Makhmalbaf’s statements on the situation in Iran has been released. He is very well-connected in Iran. I have translated his words for the non-Farsi speakers. Iranians living in Italy and other parts of the world, I urge you to not give up, because the people in the line of fire are are not scared. They are all chanting, “natarsim natarsim, ma hame ba ham hastim (Let’s not be afraid, let’s not be afraid. We are all in this together). We haven’t seen this type of togetherness in a long time. This really has been our issue. We are aware people, but we were afraid because the oceans of Iran had become mere water droplets. In the past days, the water has been found again in the oceans. We have found our unity. We need to continue protesting in front of the embassies and lobby the issues pertaining to the people of Iran- with help from world governments, journalists and citizens. We need the world to recognize Ahmadinejad as the leader of a coup d’etat and not as the leader of Iran. If this happens, we will be successful. We have already been successful. Iran’s history the past 30 years has been dissapointing. Now, our dissapointment has been expressed. We have found each other again. Even with all the violence happening in Iran, the Iranian people are more kind to each other now. For example, some put their motorcylces on fire, destroy their vehicles, so the fuels of their vehicles suppress the effects of the tear gas. They are defending each other. Around the world, we see that people have put their differences aside. We want to have the rights to our future. I think that every Iranain in Iran is a commander, a force. Every Iranian outside of iran is a representative of the people in Iran, a reporter. Every Iranian who gets killed in the streets is a martyr. They are also all media, filming with their cell phones and uploading the content onto Youtube. We need to take these videos from Youtube and send out the links- send them to the reporters. You can help the reporters who may not be able to find all the videos amongst the many being uploaded. We need to work collectively to spread the information coming out from Iran. Friday night, at sunset, light a candle. Think about and respect the deaths of the brave. The Iranian people are planning to do the same outisde their houses, on their roofs, chanting: “Allah o Akbar. They will be chanting “Allah o Akbar” to not prove their religion, but to voice the intolerable pressures put on them by the government. Wearing the colour green is not to represent Mousavi, it is to represent a movement (democratic movement). We are all supporters. Right now, none of us belong to any specific groups- we need to unite. This is to speak out against Ahmadinejad, Khamenei, and 30 years of dictatorship in Iran. We want to take that closer step toward democracy. We should follow the footsteps of Ghandi and Mandella. We want the people of the West and the media to listen to the words of the Iranian people in Iran. I am with you, we are all together. However, we do share the same sentiments. Share this video; share the translation with the world. Hamad Saber has posted pix of the protests, including days five and six. Go here to see them.